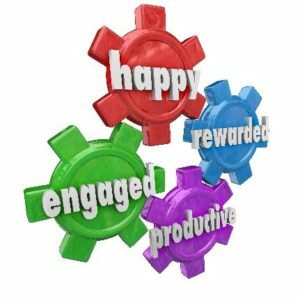 There is significant emphasis on employee engagement these days. Hospital administrators are concerned with ensuring their patients have a positive experience – and much of that is influenced by the interaction they have with hospital employees. It is clear that employee engagement positively influences the fluidity with which work gets completed and patients feel valued. The challenge is developing your employees into forward-thinking, engaged individuals as well as encouraging those already engaged to remain committed and bring others along. Purpose drives decisions. Employees with purpose take pride in their work when they recognize how their role fits into the bigger picture. We enjoy knowing that we make a difference in the lives of others and our employees are no different. Regardless of their specific role, it is vital for them to approach their day-to-day tasks with a clear sense of purpose. When they do the little things right, they make an important stamp on the big picture. Help employees gain a sense of purpose by communicating with them, involving them in decision making and asking them to serve on committees. Communicating team goals clearly and regularly can also help our employees internalize purpose. Aligned Values are critical. Not only should we make efforts to hire based on aligned values but we must reinforce and remind employees of the hospital’s values so they can aspire to exemplify them. In October 2013, I spoke about aligning hospitals goals and believe it is also critical to align values. Make hospital values a part of core communications. More importantly, model the values yourself. Employees are engaged when they have a clear understanding of what is expected of them. Communicating openly and directly goes a long way in connecting you with your employees and engaging them in larger, strategic goals. Employees will model your actions and attitude. They must embrace your initiatives and understand. Communicate with them in a way that empowers them. They are your partners who need to know that you believe in them and that you expect great things from them. Management must lead by example but also provide meaningful recognition. Employees who understand how their role fits into the larger picture, embrace hospital values, and participate as active members of a team need to be recognized when goals are reached and expectations exceeded. Recognized employees feel empowered and they serve as models for their peers. An example of a successful recognition program I was lucky to observe first hand is the 5 Star Status Program which allows peers and patients to nominate employees who have gone the extra mile. This results in recognition and rewards for the employees including gift cards, breakfast with the hospital president, cafeteria vouchers and even time off. Engagement training should include desired engagement attributes. Give concrete examples of the type of behavior you’d like to see. For example, “Fair Tone” is an attribute demonstrated naturally by an engaged employee. Patients can tell genuine interactions. Take for example, the presentation of a breakfast tray. What are the implications of these two presentations? Both interactions are very brief but the patient experience is quite different. When Employee B engages with the patient their words are specific and more sincere. Employee A gets the job done but doesn’t add to the patient experience or provide any indication that they care. Employees benefit from a strong self presentation, which can be trained. We all want to put our best foot forward, look our best and make a good impression. Uniforms should be comfortable, crisp and well functioning. Employees can benefit from coaching on how they present themselves. Encouraging good posture and eye contact can go a long way toward sharpening an employee’s perception and inward sense of pride. Body language communicates more than the words we speak. Mirroring your audience, projecting your voice, smiling and maintaining an open body position affirm that you are a trustworthy and kind. We can help our employees by providing them with training on how to share the best versions of themselves. Employees can be trained, but it is critical to focus on attracting the right people from the beginning. Leadership roles in our hospitals require extensive vetting if we pay the same careful attention to those we are placing on the front lines with our patients we reap the rewards of better service. The 5-star club I described earlier involves engaged employees and HR focus during the hiring process. People tend to gravitate to those most like themselves and highly engaged employees provide excellent insights during the interview process. When you have a high level of engagement, you will witness acts that can even take your breath away. We encourage you to read this most amazing story from Gwinett Hospital. A man with such loyalties he put himself at risk to get his job done; commitment that we can only hope for from our staff. A man that takes his role as so essential, to the success of the process, that he was willing to go beyond the call of duty.